20mx20m divided into 4 Squares within. 4 Balls, 1 in each square. If not enough players, take away 1 or 2 squares accordingly. 12 players on the lines, 4 defending. Regular piggy in the middle with a twist. Players on inside lines have 2 squares to adhere to, always aware where ball is. Outside players need to keep head up to be aware if the pass is possible. Change every 2 minutes to keep intensity (80-90%) high. Never stay static. Movement of ball, Receiving ball, first touch. I generally use 1-2 touch to start the drill and progress to 1 or 3 touch, never 2. Develop Aerobic and Thinking capabilities of players. Game specific work. Full 5v5 pitch/cage, Plenty of balls available for intensity and low resting times. This is played out in a reverse positional sense. Midfielders/Forwards becomes the defending unit (high pressure benefit), Defenders the attacking unit (moving under pressure with ball). 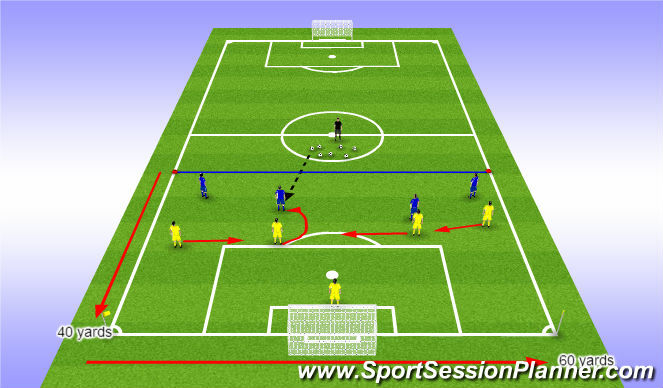 Defending unit send a high ball to Attacking Unit and start immediate high pace sprint to get in their defending position. Attackers have 10 seconds to finish at goal. All players must be visually aware of the game and prediction of runs/movements. Individual rolls and resposibilities. 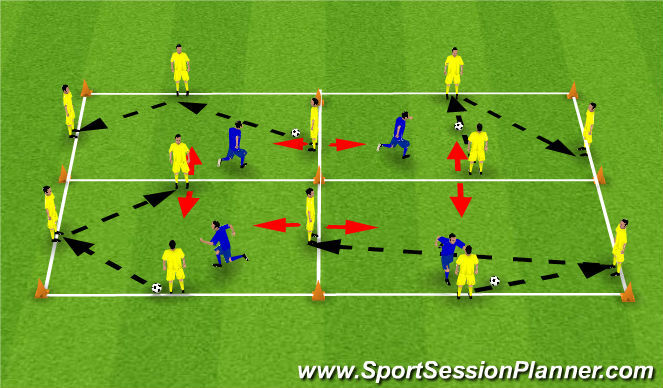 When to drop off and pull away to create space, link up play and movement with and without the ball. No coaching while play is on, let them play and if something need to be mentioned or pointed out, please do it after their turn. Let them make all the decisions during the game. Attackers: Work on Receiving skills, dealing with the ball under pressure, passing and keeping possession and using the ball effectively. Plenty of shots and headers on target. Defenders: Immediate pressure high in the pitch, timing of when to fall or tackle, jockey attacker outwards, not inwards. Use clever defending. Instructions: 1. 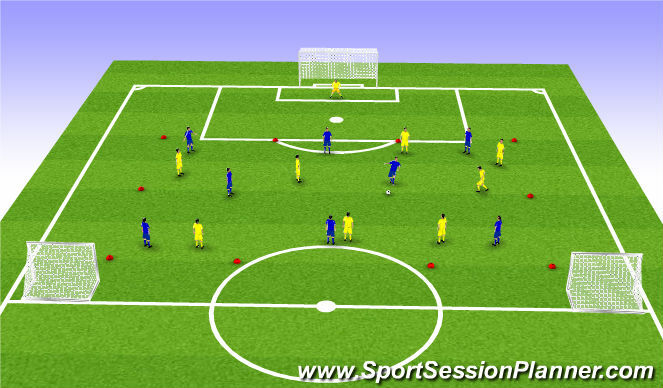 Players play 4 v 5 inside area. 2. Attacking team scores by shooting on goal. 3. Defending team scores by crossing over end line on opposite side with ball possession. 4. Offsides rule is in effect. 5. Play for a set time before rotating players. 50x40 Yard Grid, but play from sideline to sideline width. -One team is attacking the big goal and the other is attacking the two small goals at the half line. -The team attacking the big goal has to play into one of the outside channels before they can score (resets on loss of possession). -The team defending the big goal just has to score in one of the little goals. -Teams can switch sides based on time limit, or when the defending team scores in a small goal. 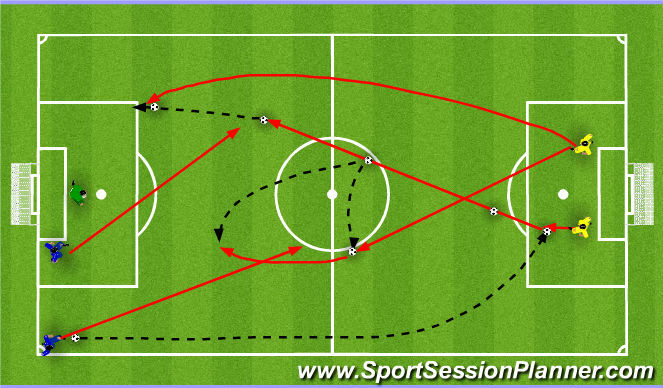 -Progression: Attacking team has to find BOTH wide channels before scoring. 1. Getting wide as soon as possible (hips opened up). 2. Do not force the attack (just because we got wide, does not mean we have to go at goal if its not on).